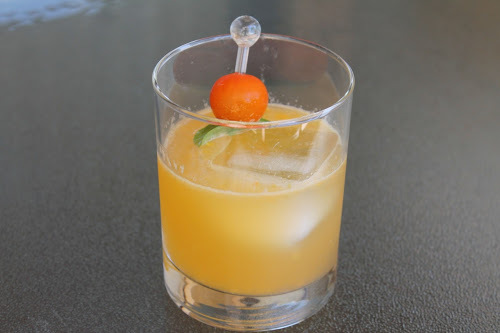 Tomatoes in a cocktail? They aren't that common, other than the infamous Bloody Mary, which is more the anti-cocktail recovery cocktail. Here, fresh tomatoes come to the fore in a recipe I found in Imbibe. I adapted it a bit by omitting salt, switching from cherry to golden grape tomatoes and serving it on the rocks with soda instead of up. The result is refreshing and summery. In a shaker, muddle tomato, basil and lemon juice. Add other ingredients and ice. Shake until cold and strain into a rocks glass with ice (if having a few tomato seeds in your glass bothers you, fine strain with cheesecloth). Garnish with tomato and basil. and fine strain into a cocktail glass. Garnish. It's true: golden grape tomatoes make tasy cocktail garnishes. Who knew? Golden grape tomatoes could make anything taste amazing. They're summer's candy.